The main difference between protoxylem and metaxylem is that protoxylem is the first formed part of the xylem whereas metaxylem forms later. Furthermore, protoxylem contains narrow vessels and cell wall thickenings in the form of rings or helices while metaxylem contains larger vessels and cell wall thickenings in the form of ladder-like transverse bars or continuous sheets except for holes or pits. Protoxylem and metaxylem are two types of primary xylem tissues that occur during xylem development. Additionally, there are several patterns of xylem development depending on the patterns of these two tissues. They are endarch, exarch, centrarch, and mesarch. Protoxylem is the first xylem developed from the procambium of the primary stem and root. The main distinguishing feature of it is the presence of narrower xylem vessels. Also, the cell wall thickening of the conducting elements of it is primitive. These thickenings can be either ring-shaped or helical-shaped. The third distinguishing feature of the protoxylem is that these cells can extend in order to undergo elongation and growth. Furthermore, in the stem of seed plants, protoxylem occurs in the center of the stem and the future development of xylem occurs towards the periphery, following the endarch pattern of xylem development. On the other hand, in the root of vascular plants, it occurs in the periphery of the root and future development of xylem occurs towards the center, following the exarch pattern of xylem development. Metaxylem is a type of primary xylem that develops after the protoxylem. Here, the cells of the fascicular cambium differentiate into the cells of the metaxylem. In contrast to the protoxylem, the main distinguishing feature of the metaxylem is the presence of wider xylem vessels. However, the xylem thickening is also in a more advanced form. These can be either ladder-like transverse bars (scalariform) or continuous sheets except for holes or pits (pitted). On the other hand, metaxylem differentiates after the elongation of the stem and root and therefore, its cells do not need to grow in size further. Moreover, in the stem of seed plants, metaxylem occurs in the periphery while in the root of vascular plants, it occurs in the center. 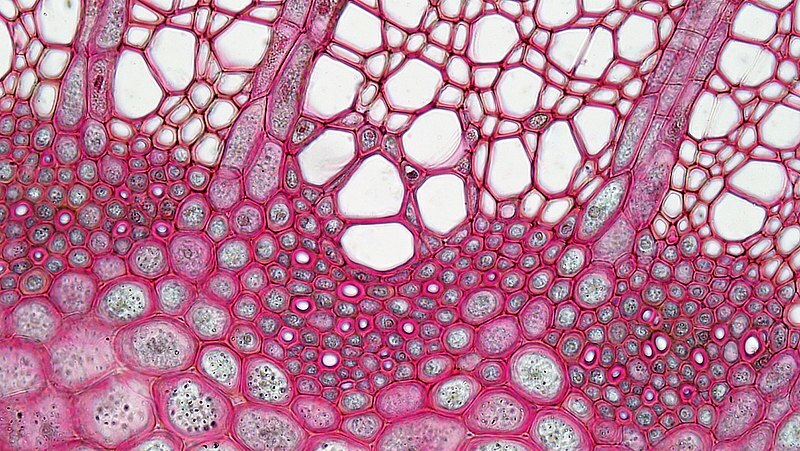 On the contrary, xylem tyloses are more frequent in the metaxylem and in the secondary xylem. 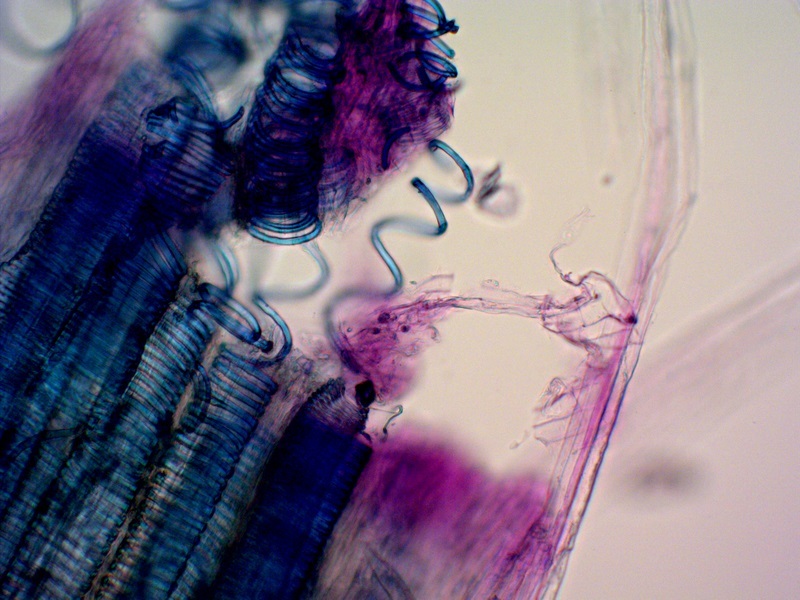 Here, tyloses are balloon-like outgrowths of parenchyma cells into the lumen of tracheids and vessels, resulting in occlusions in the xylem in response to injury or as protection from decay in the heartwood. They are two types of primary xylem tissues that develop during different stages of xylem development. Also, they develop from the procambium, a type of primary meristem. Moreover, they only develop inside vascular bundles. Besides, both are types of complex tissues containing both living and dead cells. And, both share three types of cells: tracheids, vessels, and parenchyma. The main function of both xylem tissues is to conduct water and minerals from roots to the rest of the parts of the plant. Furthermore, providing structural support to the plant is the secondary function of the xylem. Protoxylem refers to the first-formed xylem, developing from procambium and consisting of narrow cells with annular, spiral, or scalariform wall thickenings. Metaxylem, on the other hand, refers to the part of the primary xylem, which differentiates after the protoxylem and is distinguished typically by broader tracheids and vessels with pitted or reticulate walls. Thus, this is the fundamental difference between protoxylem and metaxylem. Moreover, a major difference between protoxylem and metaxylem is that the protoxylem is the first formed xylem while the metaxylem forms after the formation of protoxylem. Besides, the cells produced by the procambium differentiate into the protoxylem while the cells produced by the fascicular cambium differentiate into the metaxylem. Also, protoxylem matures before the maturation of other plant organs while metaxylem matures after the completion of the growth of the plant organs. Another difference between protoxylem and metaxylem is that the former occurs closest to the center of the stem while the latter occurs closest to the periphery. In the root of vascular plants, protoxylem occurs closest to the periphery of the root while metaxylem occurs closest to the center. Furthermore, protoxylem contains a less amount of tracheids and a large amount of parenchyma while metaxylem contain a large number of tracheids and a less number of parenchyma. Size of tracheids is also a difference between protoxylem and metaxylem. The tracheids of protoxylems have a narrow lumen while the tracheids of metaxylems have a wide lumen. The tracheids of protoxylem contain a primitive type of cell wall thickening, which can be either annular or spiral while the tracheids of metaxylem contain an advanced type of cell wall thickening, which can be reticulate or pitted. Tylose formation is absent in protoxylem while the tylose formation is present in the metaxylem. Protoxylem is less efficient in conducting water than metaxylem. Hence, this is another difference between protoxylem and metaxylem. Xylem fibers are absent in the protoxylem while xylem fibers are present in the metaxylem. One other difference between protoxylem and metaxylem is that the former is subjected to stress and strain while the latter is not subjected to stress and strain. Furthermore, protoxylem is responsible for the formation of the lysigenous cavity in the monocot stem while metaxylem does not involve in the formation of the lysigenous cavity in monocots. Protoxylem is the first appearing primary xylem in plants characterized by the presence of narrow xylem vessels and primitive types of cell wall thickening. Also, the cells of the protoxylem have to undergo stretching for their further growth as they mature before the maturation of other plant organs. On the other hand, metaxylem is the second type of primary xylem formed after protoxylem. It contains wider vessels and more advanced forms of cell wall thickening. The cells of the metaxylem do not undergo stretching as they are formed after the maturation of other plant organs. Therefore, the main difference between protoxylem and metaxylem is their structure and physiology. 1. “Protoxylem.” Biology Online, 12 May 2014, Available Here. 2. “Metaxylem.” Biology Online, 12 May 2014, Available Here.